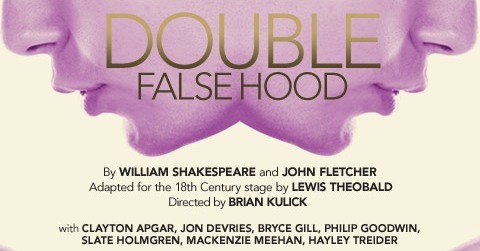 I am not sufficiently attuned to the nuances of Shakespeare-authorship debates to engage on any depth with the question of whether Double Falsehood is or is not — in whole or in part — penned by William Shakespeare himself. I will believe what I’m told in this regard and this production claims yes. In the current production of a script adapted by Lewis Theobald, with scenic and costume design by Oana Botex-Ban, and choreographically and clearly directed by Brian Kulick now at Classic Stage Company, there are pieces of familiar comedic plot devices that always feel a bit tragic to me and all work out in the end. Confused identities and thwarted lovers and hard-headed fathers of wed-able daughters (and dead mothers) and shepherds or other country simple folks easily fooled by women who don male attire that allows for a final reveal and a marriage between true loves or between resigned loves. Well, it’s that kind of plot. Just who is who takes a bit to decipher, and there was plenty of rifling through playbills and character lists during the show’s one intermission at my performance to get some of the details straight. We have brothers loyal Roderick (Bryce Gill) and nasty Henriquez (Slate Holmgren). We have a young nobleman Julio (Calyton Apgar) who loves Leonora (Hayley Treider) but cannot have her, at least for a while. Leonora is told to marry the persuasive Henriquez by her father Don Bernardo (Jon Devries), while Violante (Mackenzie Meehan) is sexually violated by this same Henriquez early in the first act, leaves her city besmirched, goes into hiding as a young man, and ultimately returns to seek revenge. In Leonora’s case “winning” is getting your father ultimately to allow you to marry the man you want. In case of Violante, she is redeemed when Henriquez’s crime is revealed, and they are joined (not quite blissfully as portrayed in this production), make right the wrong of this untimely coupling. Social webs are woven together, but love is not assured. This 400 year old plot is staged with a 20th century flair. Set designer Botez-Ban appears to utilize the planked stage floor as used by The Three Sisters in its recent run, and joins it to a perpendicular upstage backstop of the same rough-hewn material, before which are hung six or more delicately patterned rugs that adorn, mask stairways, decorate the stage. Additional rugs are positioned and pivoted as playing areas and dressing screens and other masking devices simply and elegantly throughout. Costumes appear at times to be from the 1930s or the 1940s, ranging from simple dropped waisted dresses to black tie (then white tie) formal dinner wear, matched with 1930s era leather jackets and fedoras for the shepherds and our woman in disguise. Smoothly performed, elegantly staged, and a chance to hear a rarely performed remnant of an age. A plot that is certainly not earth shattering but full of possibilities, quite nicely realized in this production.